ATEME - broadcast video compression for FIFA World Cup. Paris, July 2014: ATEME, a global leader in advanced video compression solutions for the broadcast industry, has announced that ATEME has delivered 700 Kyrion units to date to the European Broadcasting Union (EBU). matches in high-definition (HD) format, as well as all of the 4K television production of the 2014 FIFA World Cup held in Brazil. 4K live coverage included the matches on June 28 (Round of 16) and July 4 (Quarter-Final) and will also include the July 13 (Final) event. Paolo Pusterla, head of procurement & network partnerships, EBU, said: "ATEME is our encoder manufacturer of choice, most notably for the World Cup. 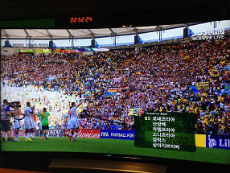 We are delighted to work further with ATEME to produce the live 4K transmissions of the FIFA World Cup." Michel Artières, CEO, ATEME, said: "We are excited to be the chosen video compression supplier of the EBU for its HD television coverage of the 2014 World Cup. It is a pleasure to be a partner of such an important organization in the global delivery of sports and news broadcasting."